Mark Duncan at Yachting Partners International sends word of a €2 million price drop on Russell Crump's joint listing with Burgess, the 69m mini-cruise ship Tu Moana. Built in 2003 by Australian yard Austal Ships, Tu Moana represents an opportunity to purchase a proven vessel ripe for conversion into either a luxury mini-cruise ship or a unique luxury yacht. She was originally built with accommodation for up to a maximum of 78 passengers with 37 spacious twin/double guest cabins with en suite facilities and large picture windows. Plentiful and well-conceived deck spaces include a main deck restaurant arranged around a central buffet with a covered outdoor dining/relaxation area on the aft deck. An enclosed lounge bar and entertainment area are on the upper deck and for outdoor entertainment there is a Jacuzzi spa and bar area on the large sun deck and a four-person spa and built-in seating on the foredeck. 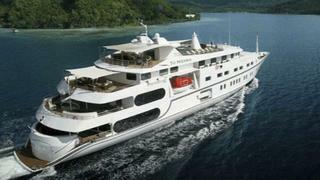 Tu Moana is now asking €6.5 million.